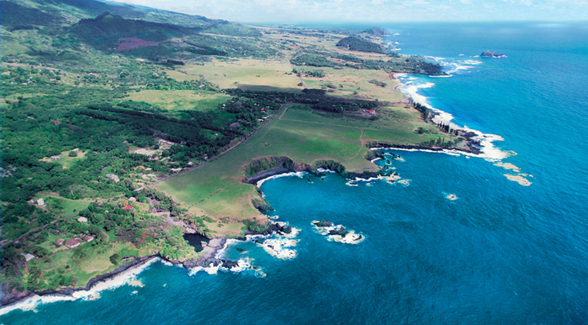 A 4,500-acre working ranch on eastern Maui, Hana Ranch surrounds its namesake town of Hana. The breathtaking property boasts two miles of Pacific oceanfront and rises 2,200 feet up the slopes of majestic Haleakala. The ranch is divided by the Hana Highway. Approximately 667 acres can be found on the ocean side of the highway, and the remaining 3,833 acres sits on the mountain side of the highway. Dan Omer of Island Sotheby’s International Realty has the listing.